To get a high ranking in online searches, your website needs to be optimized for the major search engines. You also need to create the kind of online content that people will want to share on social media sites. 1. Determine the keywords you want to rank for. Deselect "Broad" on the left. Select "[exact]" on the left. Enter keywords that you think might be searched for. We like to do three to 10 searches to find those with the largest search volumes. Check the keywords using the "Ad Group Ideas" tab and the "Keyword Ideas" tab. Both allow you to view different variations on the words you initially put in -- by theme or group and via one full list. The keywords displayed in the list should be surrounded by brackets. If they aren't, you likely skipped the second and third steps above. This process helps you discover additional keyword variations that you might otherwise not consider. Select one or two similar keywords. Few content pieces can be optimized well for many keywords, so you need to narrow it down. Keyword selections should take into consideration data points, such as search volume, relevance to the page and site content, and the likelihood that your page will be able to rank for the term (keyword competitiveness). 2. Know where to use the keywords in your copy. Once you know the keywords, think about where they need to go in your content so that it will be optimized for high search rankings. One place is the article title, where keywords tell users, as well as search engines, what the piece is about. When people link to articles, they often use the title, which will increase the chances that your targeted keywords get in the hyperlink to your article. You'll also want to use your keywords in the body of the article about three to five times. When writing, be sure to use variations of the keyword, making the content sound natural rather than stuffed with keywords. Most blog content management systems, such as WordPress and TypePad, make the article title the "title tag" by default. But there are plugins for WordPress that can allow you to have extra text fields for search engine optimization (SEO). 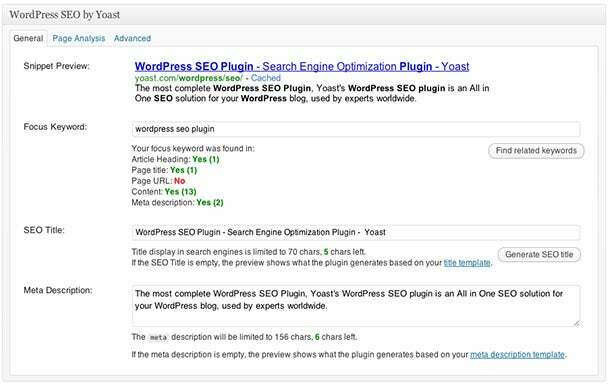 One example is the free Yoast Wordpress SEO plugin, which gives you extra fields called "SEO Title," which is the page title tag, and the "Meta Description" field. When you enter text in these fields, the Yoast plugin will show you how your article listing will likely look in the search results pages. You also can enter your targeted keyword in the "Focus Keyword" field, and the WordPress SEO tool will evaluate your page for optimization by telling you if the keyword is in all the right places to achieve the greatest SEO. Now it's time to write awesome content for the keywords you want to rank for. This content should be distinctive, insightful or humorous so your audience will want to share it with other people in their networks. Useful. Consider a list of statistics, an in-depth resource or guide, or a how-to article. Also consider multiple types of media, such as text, graphics and videos. Funny. People often think of funny as videos or stories, but it can also mean a cartoon, which can be outsourced minimal cost. If you don't feel especially humorous, get your friends together and brainstorm. Lists. Interesting lists of things can become viral. The challenge is creating a list that people will actually want to share. It needs to have shock value, laughs or the "I want that!" reaction. Infographics. Illustrating data or advice in a visual format has become a popular way to attract links. You can hire a graphic designer to help you present information in a visually appealing way. Also, there are many free and paid tools that help arrange and visualize data. If you don't have the budget for a designer or the graphics skills to do it yourself, a free infographic tool is Infogr.am. To determine which type of content to create, start by looking at the social media profiles of those who influence your target audience. See what types of content they retweet, like and blog about. Then do research on the internet and in social networks to find out what others have written on those topics. Your goal is to "one up" them all. This doesn't mean just merging other people's information. You need to provide added value. You want to develop your online network so that your followers will retweet, like and blog about your content. Try to build genuine relationships with those who could influence your target audience. The more people share your article and link to it from their website or blog, the higher your search engine rankings will be. When all of your SEO and social marketing efforts come together, they can take your brand to the next level.